After a moderate ascent leaving Santa Fe, our route tricked me with 10 miles of downhill swoop and flat. But after leaving the frontage road and entering the Pueblo of Pojoaque, the road began to twist as the terrain undulated beneath us. 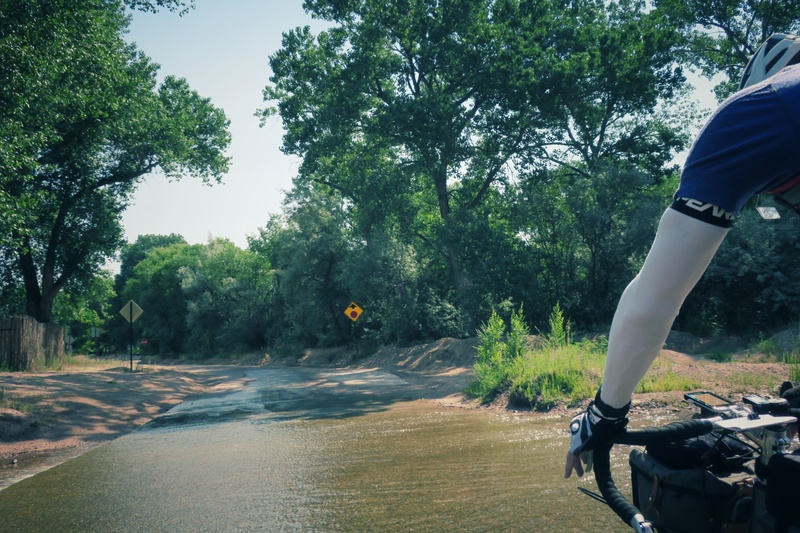 Soon after, we rode our first surprise gravel section of our tour, followed by the first surprise creek crossing. Today’s ride was an evolution of green. 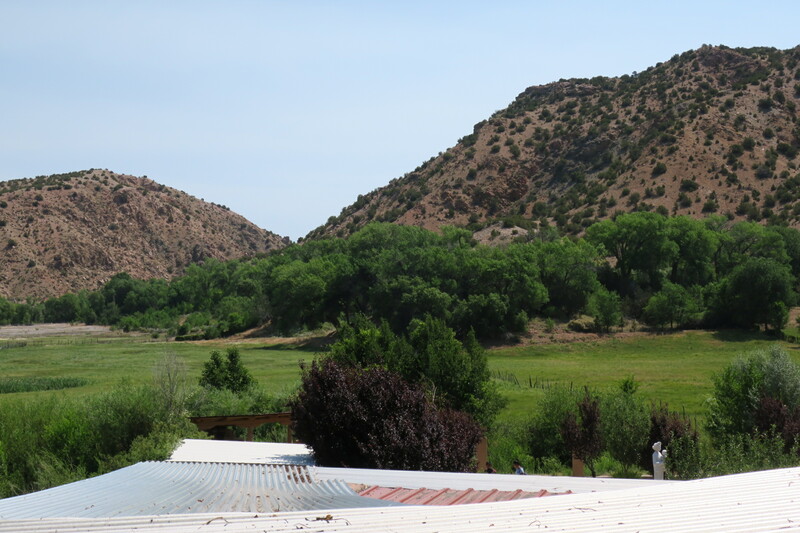 The further away from Santa Fe, the more greenery around us. It was still dry as all get out for much of the day, but definitely more lush than what we covered yesterday. Surprise creek crossing. Don’t get any ideas, Jerry! We passed through Chimayo where El Santuario draws the tourists. 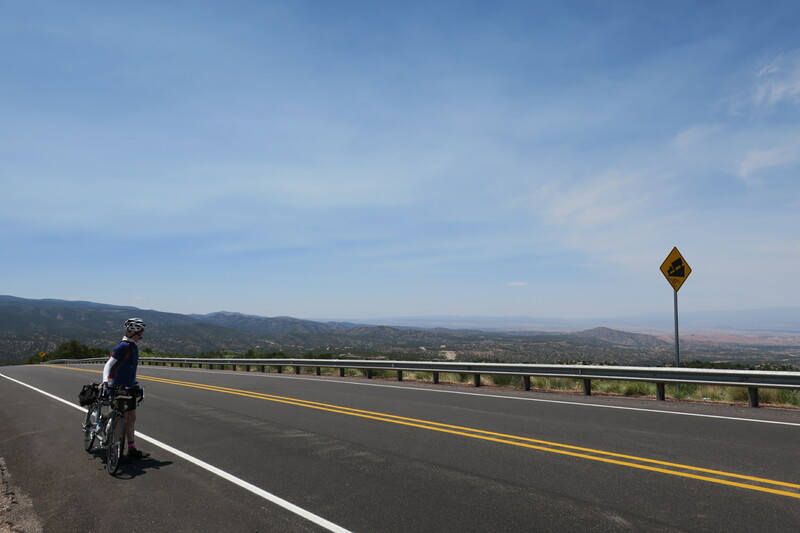 I bought some hefty banana bread there from a local vendor and we pedaled on via the “High Road to Taos.” For starters, that meant climb 2,000 feet over 13 miles. “This ride is not for wimps,” I told Felkerino as I dug in my heels. As a dabbler in wimpiness, I felt qualified to comment. Surprise gravel and creek crossings can be done by wimps. A wimp can purchase banana bread. But condensed climbing like that is simply not for wimps. We eventually reached our summit, though, and rolled along the choppy ridge line for what seemed a long time, but was really only five miles. It took concentration and effort, both of which the banana bread helped me unlock. I don’t see many people on these side roads. Along the High Road to Taos, we saw a car here and there, but little traffic overall. That is wonderful, as it allows for a more serene ride experience, and my fingers are crossed that it continues such. 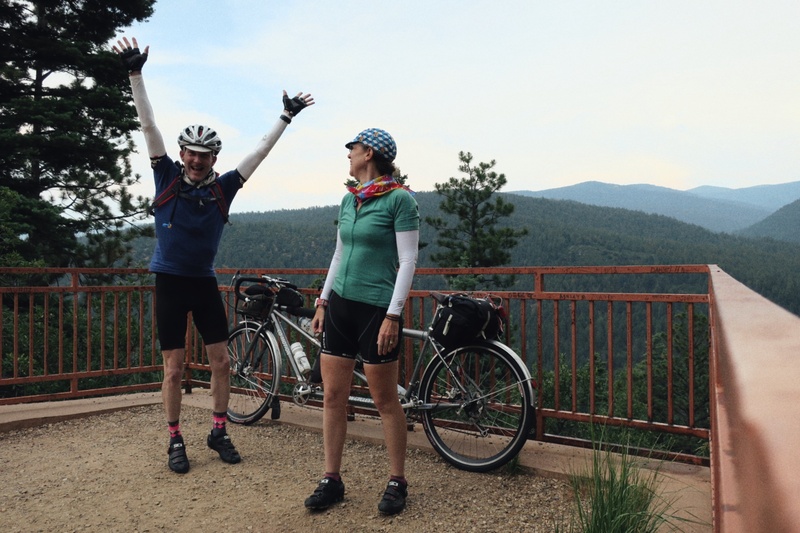 On our last extended climb for the day – before a spectacular 13-mile descent into Taos – we also came within shouting distance of a juvenile bear. We didn’t shout, and instead paused to assess the situation. The bear took no notice of us, and I looked around for any sign of a mama bear. I saw none. 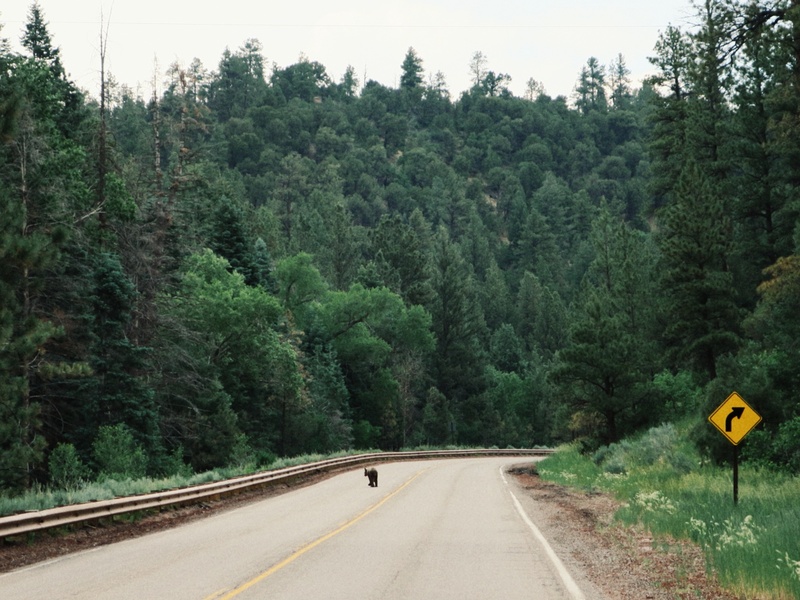 A car approached from the opposite direction and the bear hastily crossed the road and lumbered off into the woods. No more bear, and we continued on our way. It’s exciting to see wildlife, but I always keep in mind the “wild” part. It’s good to be a wimp in these types of situations, I’d say. After reaching the last summit – these summits don’t seem to have names here – we stopped to be true tourists and take a bunch of photos. I was really into this part of our ride. We then swooped into town, and I washed my clothes in the hotel sink and squeezed-dried them in the hotel towels. The glamour of bike touring! 76 miles and 5,500 feet for the day. And now, time for more banana bread and some dinner. You are really getting me fired up for my fall tour with your posts. Sadly I won’t have the dry heat. Maybe a hurricane though. Mary, we almost crossed paths! My Fuller Center Cross Country rode from Taos to Santa Fe on Saturday. 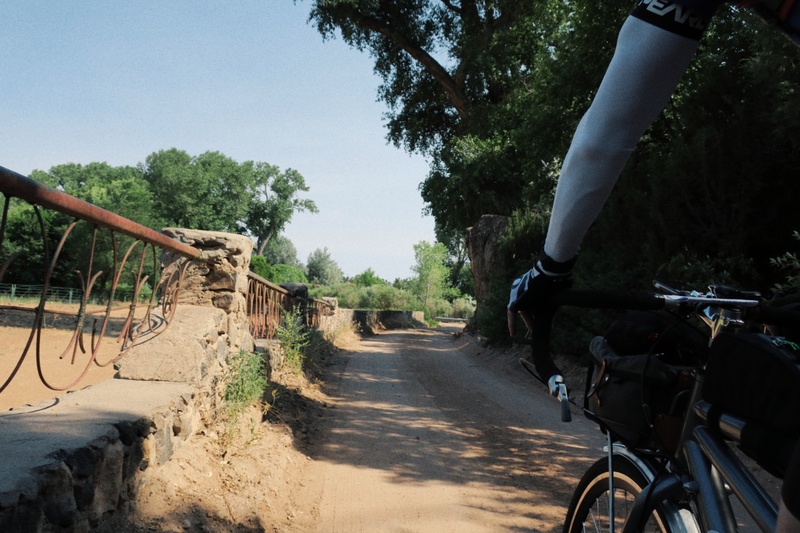 We LOVED the downhill from Taos (your uphill, sorry) and then battled wicked headwinds all the way into Santa Fe. There, my mom met me (having come up from El Paso) and I concluded my half-x-country for this season. We’ve seen many cyclists along the route you’re headed though, many north bound. The southbound ones tend to be the Continental Divide riders who have been forced onto the roads due to wild fire re-routes. THEY are a fun group of folks! Ride safe and have fun, both of you! Sorry we missed you, Kelley! I’ll have to catch up on your posts and congrats on your big ride! Check out Ojo Caliente, if you get the chance. Erik, I saw the turn, but we ran out of time to check it out. Next time! We pedaled the high road in 1984 as part of our cross country trip. I especially have fond memories of this road. I hope apricots are in season for you, I couldn’t believe the size of those babies – as big as baseballs! Loving following your tour, enjoy your time. I always have a little trouble disconnecting from work but an challenging bike ride does the trick. Quick question, what bike lock do you use? It looks like a light weight set-up. I was in Santa Fe a week ago. Sorry I missed meeting you there, but glad you are enjoying some good rides. Fingers crossed weather is a bit cooler than last week! Oh man, it would have been so great to meet you, Lynda! 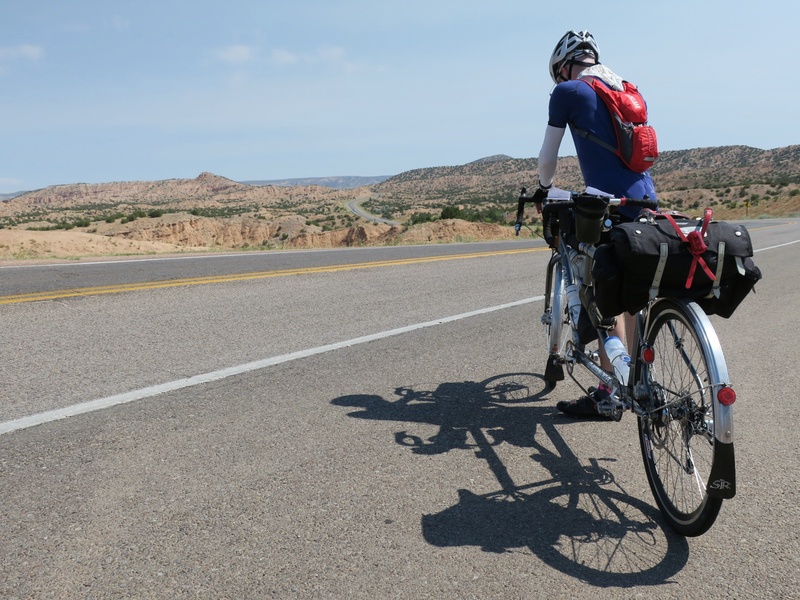 This ride brings me back to 2000, when I rode several routes around New Mexico, from El Paso to maybe 20 miles north of El Santuario (with a lot of driving in between). One memory from that ride was altitude makes a difference, especially on a hot August day, dry heat being worse. I’m happy to read that you made it made it to Taos and the really high country and survived. I underestimated New Mexico, both in terms of elevation and overall dryness. It is a truly beautiful place though. Well heck, I’m late to the party (pretty much always). I could have had my friends in Truchas arrange fresh food! So much great food in NM! Ah well, you are up the road a bit and hopefully with good weather, sans wildfires.